Will Hutchins reminisces about The Academy Awards, movie love themes, Joseph Mankiewicz. Howdy Foks! I remember the good ol’ days of the Academy Awards. At the ‘32 Oscars, Wallace Beery and Fredric March tied for Best Actor. They both took home golden statuettes. Beery for “The Champ”, March for “Dr. Jekyll and Mr. Hyde”. Before the ceremonies Beery was all afret. He went to a Cockney fortune teller. “Will I win?” he asked. She looked deep and long into her crystal ball. Finally, she said, “Guvnor, beware the ‘yde of March!” They really oughta lose the Best Song category. Where’s Irving, Cole, Hoagy, Harold, Jerome, Richard-and-Lorenz, Richard-and-Oscar II? They’re all gone, gone with the woodwinds. Movies today are geared toward the young. (That’s where the money is.) They are concept-driven, they are rife with ear-splitting devastation of every stripe. Look! Here come the hero and heroine, running at us for dear life, a mammoth explosion and conflagration in their wake. By comparison, the burning of Atlanta was a hot foot. Back in the day, movies were family-oriented, story-driven. Mitchum said, “In movies, the story is king. Always has been.” Critic Jon Ruskin wrote, “The work of the artist is to be two-fold only: To see, to feel.” I, too, want to see, to feel. What we have here is sorta the numbing-down of America. So, I turn on TCM—“Dark Victory” (‘39). Every time Bette Davis goes upstairs to her bedroom to die, and the music swells, I’m like Pavlov’s dog—I blubber. Every time! Babs hates this. Long ago, when I worked at Warner Bros.; I got no respect. In the early a-yawn, bleary-eyed, I’d show up on the set. Script girl Mae Wales would announce my arrival with bombast—“Fooger Shoot!” “Meshuga Foot!” Stu Luther up in Elmira, NY, calls me “Honey Heels” and “Syrup Soles”. Hmmmm. Anyhow! Sometimes the script called for Sugarfoot’s getting the audience to feel that he was feeling some sorta emotion, maybe something a tad deeper than the bliss of Swiggin’ a shot of sarsaparilla—with a dash o’ cherry. I’d resort to filmflammery. 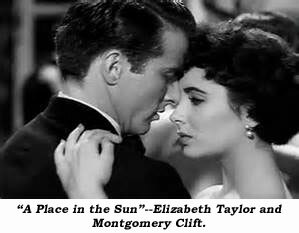 Before the director hollered “Action!” I’d think about the love theme from “A Place in the Sun” and the final scene between Montgomery Clift and Elizabeth Taylor. I’m a sucker for farewell scenes. This is one of the great ones. This is one of the great love stories. Liz comes to visit Monty in his Death Row cell. He has a rendezvous with Old Sparky. Time is up. Liz starts to go. She stops and turns—with all the love and sorrow in the world mirrored in those ultra violet eyes, she says, “We always seem to be saying goodbye.” And then, a smile, a sigh, a shrug—and she goes. Pardon me, while I gather myself. Somewhere in time, Babs and I sat in the Motion Picture Academy theatre for a tribute to Joseph Mankiewicz (Biggest turn-out since Mae West gave a talk there on stage in her boudoir set, in her neg+ligee, baby blue and pink lighting, harkening back to those halcyon days of the queens of burlesque). Gregory Peck paid his respects. Ditto Roddy McDowell and Vincent Price. 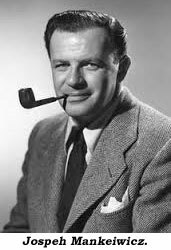 Mankiewicz, himself, spoke. Then, the Jewel of the Nile, La Liz, made her grand entrance amid applause and ahhhs. Suddenly, I noticed four weirdoes facing the audience, standing against the wall adjoining the stage. Scary gargoyles. “Bodyguards,” said Babs. I said, “More like goombas in a police line-up. Ah, fuhgeddaboudit! Let’s go!” “No! !” We were in a captive audience. No one escaped. Ah, Hollyweird! I never got the hang of it. So many unspoken laws of survival. Let’s say you’re struttin’ down Rodeo road in Beverly Hills, feelin’ finer than frog hair. Hey! Here comes good old Charlie Werkle! Years before, you met at the unemployment office. You joined forces. All aboard the ship of success, laffin’ and scratchin’. Good buddies, evermore! You stand waiting, arms spread, a warm grin. Charlie is just back from Europe. He worked on a Croation-Swiss-Turkish production, “Nov Shmor Kapop”. You? You are between jobs. Might as well be Claude Rains, sans dark glasses, sans gauze, sans clothes. Good old Charlie Werkle looks right thru you, passin’ on by, nary a word. Someone ought to write a book: Subtect City—The Game of Hollywood. The rules of their game make Chess look like Tiddly Winks.